Discussion in 'Archive' started by CM Yukimura, Apr 10, 2018.
if you want to be a try hard and get max levels skills + the skills you want you will be at this for a very long time if not forever. Rosedunn and MaraSol like this. Yeah, this also bothers me, some of the skills are useless with such high CD; no penalty rez has 24 hours CD on lvl1; though the automatic water consumption with is 30 min CD must be a joke. In order to Reincarnate your Fairy, you need to unsummon the Fairy first and then click on the “Reincarnation” button in the Fairy menu. The process will require an item called “Authority of the Fairy Queen”, which is a Pearl item. The materials for Fairy Upgrade are Sweet Honey Wine or Oneteia Dark Honey Wine. Oneteia Dark Honey Wine is a Pearl item. (And sweet honey wine is very hard to craft as it requires blue grade honey; 400 sweet honey wine for the last tier for 100% chance). You have to shoot wild beehives on trees with a rented matchlock gun; they drop Wild Beehive, you have to grind those to get regular, green or blue grade honey; of course, the blue grade is the hardest to get. You cannot farm honey (yet), but I really hope they add something like that soon, or this whole fairy thing will be messed up. It doesn't have to be a rented matchlock. I went to grind first, spent an hour in combat, then another hour shooting beehives to do it by crafting, and the crafting turn in doesn't work..
Is it OK that I can't see my fairy at all? There are 2 types of Beehives. Beehive + Tree as a single monster and a Beehive hanging down from a bigger tree.. the 2nd one is the right one. Rosedunn and Dunkleosteus like this. hour no.6: Still no petal drop. I am not sure how he meant it, but i think people are confused about the turn in when you craft the honey. You need to go and search for the rifts, not go back to kama temple to the previous rift. 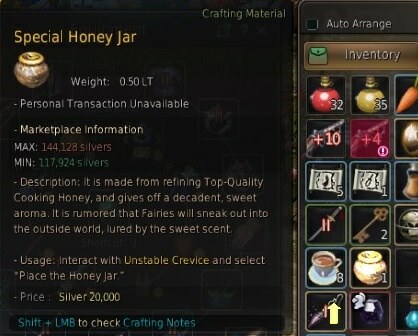 What I meant was the final crafting result Special Honey Jar (which you need top quality honey >ie beehives to make) does not have any way to apply it to the crevice at Kamys temple. I had the ingredients for it, except the top quality honey, and gunned beehives after seeing the petal was likely a rare drop.. I got three of the water event seals in an hour of grinding, but no petal. Edit to add: Also, btw the recipe is 5 fruit of Abundance, 5 Sapphires, 1 essence of liquor, and 2 leavening agents.. wasn't listed anyplace, but it WAS in the Alchemy tool (which was how I found it). You can only use the crevice in the Kama temple once, after that you need to find other crevices. Can't see the fairy around other player's character. A bug or intentional? The show/hide fairy option does nothing for that. Npc wont even let me finish the first quest, I probably gave the wrong type of honey to her(regular cooking honey) I had to forfeit the quest because it wouldnt complete, the quest reset but now it shows I already gave her the honey and she wont let me give her higher grade honey(option to give is blacked out). What a lame quest if the quest required high grade honey in the first place then it should have stated that in the quest instructions, its just states in instructions cooking honey no preference. I cant seem to progress nor get the fairy. No, simple cooking honey was okay, that is why it is blacked out, cause you already gave it to her. Didn`t you get the honey jar from her? Also if you attempt to turn in another petal to Theiah BEFORE releasing your fairy you lose the petal, with no explanation or stop, just gone.